As we come very near the centenary of the last apparition of the Blessed Virgin Mary at Fatima, it is an opportune moment to offer a brief review of a recent CD from the Choir of St. Cecilia at St. John Cantius Catholic Church, under the direction of Fr. Scott Haynes, SJC. This stunning disk of Portuguese polyphony brings the listener to the heart of the Iberian Renaissance and the Marian devotion prevalent at that time. 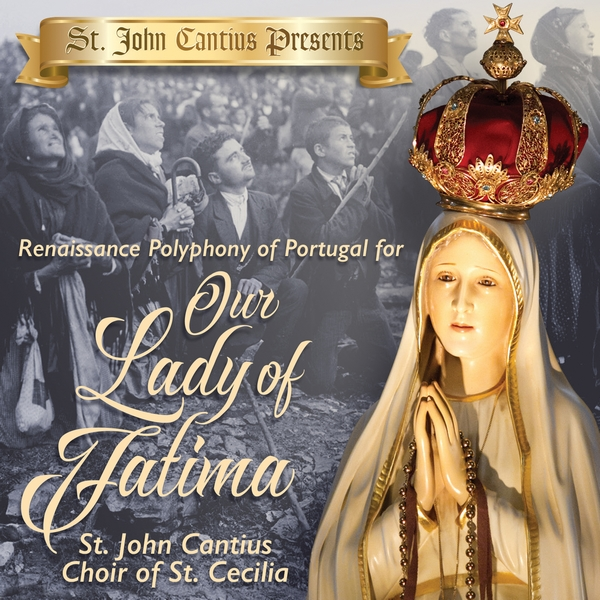 Renaissance Polyphony of Portugal for Our Lady of Fatima encompasses pieces by a wide range of lesser-known Renaissance composers, superbly sung by the St. Cecilia Choir. One of the most beautiful pieces is the very first track, Beata Dei Genetrix Maria by Francisco Guerrero. In six parts, this luscious motet sets a text from the feast of the Presentation. Guerrero’s setting of Ave Maria Dulcissima gives us a hint at Guerrero’s personal devotion to the Blessed Virgin. The informative liner notes tell us that “Because of Guerrero’s lively devotion to Our Lady, he composed many motets in her honor, earning the nickname ‘El cantor de Maria’ (the singer of Mary).” Dulcissima Maria, another offering of Guerrero on this disc, is a simple four part piece which flows on in peaceful counterpoint. Some of the other composers on the recording include Duarte Lobo (1556-1646), Pedro de Escobar (1465-1535), and Manuel Cardoso (1566-1650). Pedro Escobar, a composer who lived earlier in the age of “Renaissance polyphony,” offers a delightful piece in Spanish (the only non-Latin piece on this CD), accompanied by drum, which delights with its more medieval harmonic and rhythmic style. The twenty-four singers of the St. Cecilia Choir exhibit a beautiful blend of voices; the sopranos gently arc with little vibrato over the peaks of the melody, while the altos and tenors supply beautifully phrased inner counterpoint. The basses are loud and rich, providing a strong underpinning for the whole auditory landscape. The CD is recorded in the church of Saint John Cantius in Chicago, the Cantians’ motherhouse, which has an acoustic perfectly suited to this repertoire. It also features the same church’s Oberlinger Portative Organ on three tracks, including beautiful variations on the hymn Maris Stella and Magnificat with the chant and variations alternating, by the composer Manuel Rodrigues Coelho. The organ variations are meditative and give good opportunity for the woody-sounding flute stops of the Oberlinger organ to be used to great advantage. The organ is also heard in a very pleasant Tiento sobre la Letanía de la Virgen by Pablo Bruna (1611-1679). A highly recommended CD for your sacred music collection. The link at Cantius has extensive detail about the tracks as well as a short video presentation if you'd like a taste of the music.